In this visual presentation, Jacquelyn Suter from Goldleaf Myanmar will give us a unique glimpse on how artists in Burma today express their interpretations of their society. Rare works not seen by public will be shown. See the Chiang Mai Mail’s write-up of the talk here. As always, ten per cent of any art sales, and 20 per cent of any other sales will be donated to a local organisation, Cultural Canvas, to provide art experiences for the children of migrants in Chiang Mai. 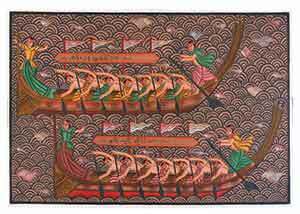 We will then have another talk toward the art side of art and ideas: Jacqueline Suter will speak about buried social commentary in modern Burmese art. Back in the ideas direction, Bryce Beemer will talk about Siamese war captives in Burman capitals. That will take us up to Songkran, and perhaps beyond. When possible, talks will take place on Sunday evenings. A few writers have also agreed (or half agreed) to give talks, but their dates are yet uncertain. Thanks to 72Studio, Chiang Mai for image processing.